So that’s how Nendoroid Sendo Erika‘s box looks like, eh? Yep, it seems that the Nendoroid rendetion of Fortune Arterial‘s heroine is going to be released on June 24, and sofmap is currently putting up the box for display at their stores. Anyway, Mikatan has also posted a little tidbit about the upcoming Summer WonFes 2011. The official site (http://whl4u.jp) will be updated to WHL4u 14 tomorrow. Mikatan is going to preview some upcoming WonFes products tomorrow. 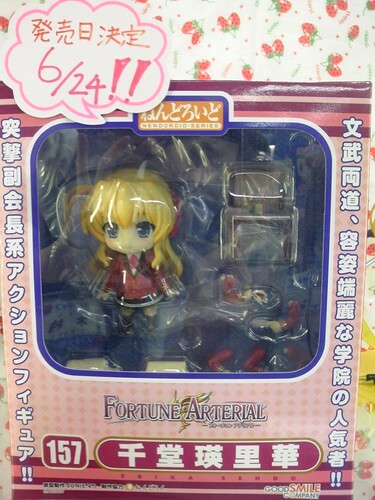 This entry was posted in News and tagged fortune arterial, nendoroid, sendo erika, wf2011, whl4u. And I have a question, what is exactly the Wonder Festival? Is a GSC sell event? When this event happens? Anybody can enter there?